That’s all you need to say in Burlington to spark a lively conversation – highrises, public access, the Pier, the Beachway, and more. It’s a cherished community value. But how to protect and enhance it for the long term? That issue was front-and-centre at the October 15th meeting of City Council. The following links take you to: (1) City staff’s original report about continuing to own or selling a piece of waterfront property; and (2) the webcast of Council’s meeting. 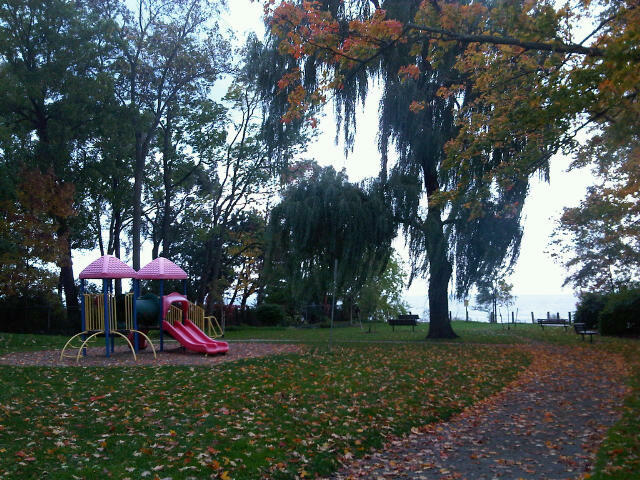 One beneficiary of this decision will be Port Nelson Park in Ward 4 (see photo above). Some passionately feel the bad outweighs the good in this case. Put more dramatically, selling these public lands on the waterfront is like selling a piece of Burlington’s soul. I don’t agree. At least, it’s not true in this instance. Having said that, though, one thing is undeniable. Burlington’s soul is being tested. I believe that without setting and committing to a simple fundamental policy about how the City deals with its own waterfront properties, the landscape for future decision-making can become a very slippery slope. This matter seems to be the latest example of our City leaders heading into uncharted local waters without a compass. Council and staff always need to start with a crystal-clear understanding of what actually comprises the overarching and definitive policy to be followed, and respected. What is it here? Based on this decision, those waters seem to be quite murky now. When dealing with absolutely critical issues like our precious waterfront, final decisions must be principled and visionary. City council votes 6-1 to sell lakefront property. Public may never know what the selling price will be. Who do you agree with? Have you recently walked the areas involved? Worth the effort. A respectful, healthy exchange of ideas is exactly what our waterfront needs. Please, SPEAK UP, so City Hall can hear you! Brian: the Burlington Gazette is not a blog – it is a newspaper on a web site that is a member of the Ontario Press Council. A blog is a vehicle that carries the views of a single person. While I write much of the material there are two part time reporters and five columnists who write regularly. We cover every city Council and council committee meetings as well as some of the Regional Council meetings. We cover the arts. We unfortunately do not cover the Board of Education and we do very little on sports. In time we will cover them as well. Blogger’s Note: I’ve amended my original post to refer now to Pepper’s website as “Burlington Gazette”, and will let readers decide how to classify it. Brian, I was over to the former potential parkette last night. It is substantially different from Port Nelson Park. It would have had two entrances and at least twice the width. There is a well defined lake front (sea wall) so one could get close to the water whille walking (or sitting). It would be much more enjoyable for a senior like me to visit.